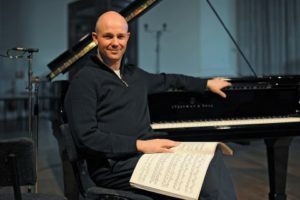 Charles Owen, one of the finest British pianists of his generation, is adding the Algarve to his extensive international career. On September 27th and 29th, 2016 he will be the featured artist of the Amigos de Música at Os Agostos with a varied programme of works by Bach, Ravel, Chopin and Liszt. Details of the two programmes will be available on the Amigos’ website (www.amigos-de-musica.org) shortly. The AMIGOS DE MÚSICA is an international group of around 90 members who stage musical activities by internationally renowned musicians and also sponsor young Portuguese musicians. It is a non-profit organization and celebrated its twenty-fifth anniversary last year. This entry was posted on Thursday, August 25th, 2016 at 6:15 pm	and is filed under Press Releases. You can follow any responses to this entry through the RSS 2.0 feed. Both comments and pings are currently closed.